I had awesome speeds up until tonight where my connection speeds seem to have dropped big time. I have rebooted a couple of times and even power cycled a few times. Each time getting a new ip address but not speeding it up. Do Sky employ evening bandwidth throttling? 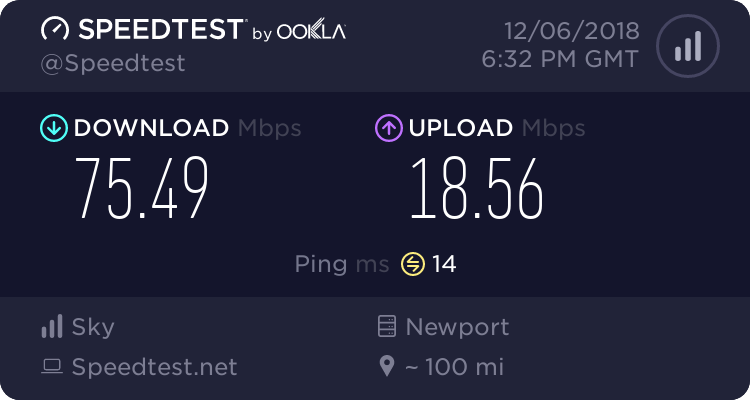 Have been connecteed at 13mb regularly before tonight. am in the master socket, have also tried extension sockets. The thing is - it has been fine - which leads me to beleive that its not socket related. But i could be wrong. On the max connection and 1.5km from the exchange. Tis very strange - all was going well, then this evening i fire up WOW and can hardly play. Check some ftp downloads from my webserver - of which i would normally get around 800kbps - and was doing first thing this morning, now im racking out about 80kbps. Is disconnecting / reconnecting from the router menu going to help "sync" at a higher level? do i do it until i get a decent connection speeD? first, prob best to change ur profile cause ur not on Base now are you!! lol!! if u were syncing at 13MB before and now only 3.7MB now something has definately happened to ur line/connection so trying the test socket will rule out the issue being down to internal wiring....have you had bad weather recently? do u have overhead phone lines? Hehe will change profile in a sec. No bad weather - the oposite actually - weirdly. The other thing - ive only been setup for a couple of days and i heard rumours about the line being "tweaked" etc during a setup phase? Oh and on my router connection page - i sometimes get a "lcp down" message - whats the lcp and what implications does that have? Nah dont have one of them. We have only just moved here and the wiring is pretty old - is putting one in something that i can do myself? Any idea on this LCP down thing? a search seems to suggest its a remote problem when connecting rather than something my end, but that just might be me jumping on the ever growing bandwagon. all lcp is, is a server sky's end, the router needs to connect to it to use the internet, if it says lcp down, it means no internet available, and there is either a problem at local exchange such as an outage, etc, or there's a problem sky's end and you need to ring them to find out(don't ring your local exchange lol).